Damo and Vikki's Round the World Trip! : About Us! If you want to know more about us you’ve come to the right place!!! We are both 28 years old and from the UK, Damo is from Stoke-On-Trent and I’m from Southampton. Since we were 18 we’ve both worked on holiday parks doing entertainment. If you’re not from the UK think holiday resorts! The job included daytime duties like kids clubs, running the evenings entertainment and performing in shows. It was a pretty full-on job! You live on the park, work day and nights and get 1 day off a week. 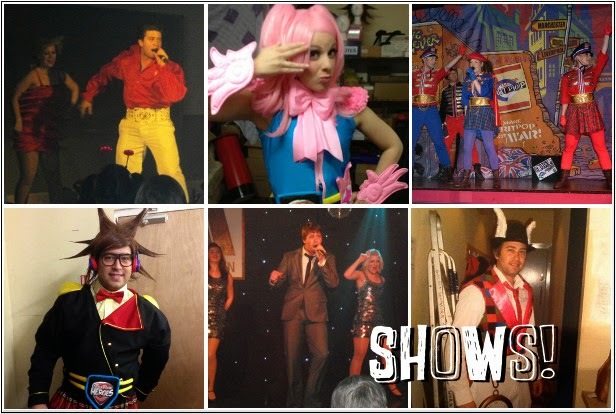 Here’s a few photos from some of the shows we performed in! We met in 2010 when I was working on a park on the Isle of Wight. We’ve now been together 4 years and been engaged for almost 2!! We got engaged at Disneyworld in Florida during my fave show Fantasmic! Travelling has come before wedding planning but I guess that will be the next thing when we eventually get back to the UK!